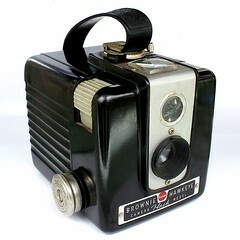 The Kodak Brownie Hawkeye is a Bakelite box camera that takes 12 6x6cm images on 620 film, made in the USA and France by Kodak, between 1949-1961. 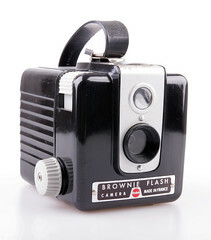 There were also examples labelled "Brownie Fiesta" and "Brownie Flash". 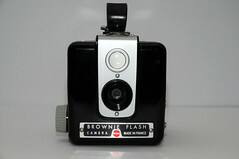 The original design did not have a flash facility, but the Flash model was added in 1950 and called the Brownie Flash in France and the Kodak Brownie Hawkeye Flash in the USA. Earlier models of the camera have a metal film advance knob; later models have a knurled plastic knob. The camera is compact, box-shaped, with a carrying handle on top and a winding knob to the photographer's right. The design aesthetic is a throw-back to the Art Deco era of the 1920's, with clean minimalist fluting on the sides and an attractively-designed front. 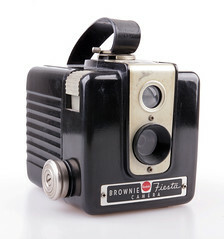 This camera is the work of an Arthur H Crapsey, who designed other plastic box cameras with similar aesthetics such as the Kodak Brownie Bull's-Eye and the Kodak Brownie Star series, as well as some more advanced cameras for Kodak in the 40's and 50's. The camera has a brilliant waste-level finder, which has a fairly similar lens to the taking lens and thus seems to provide a decent preview of the framing. 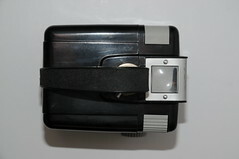 The camera also features a switch (opposite the shutter-release, for symmetry's sake) which allows "bulb" exposure, though no tripod socket is provided to steady the camera during long exposure shots. The precise speed of the shutter (when bulb is not used) is not widely-known, and likely varies depending on the cleanliness of the mechanism and the strength of the spring, but it is commonly said to be between 1/30th and 1/50th of a second, slow enough that the photographer must have steady hands or brace the camera. As the camera has fixed settings, the only exposure parameter the user can change is film speed, with speeds 50-100 being serviceable in the brightest sunlight, with 160-400 being within exposure latitudes for most daylight shots as well. Unfortunately, the aperture is simply too small for existing-light photography indoors, even in well lit rooms at ASA speeds of 800 and 1600. The flash contacts are of a type common to Kodaks of a certain era. 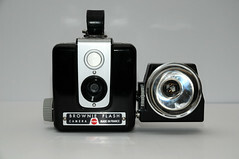 The flashgun provided with the American version of the Hawkeye Flash is the "Midget," which is the same one sold with the Brownie Starlet, Brownie Starflex and Brownie Bull's-Eye. This is a side-mount unit that fires only M-sized bulbs. It must be attached without a bulb or without batteries. Otherwise, it will most likely fire due to accidental contact, waste a bulb and potentially injure the person holding the unit. Name variants of this flashgun exist. 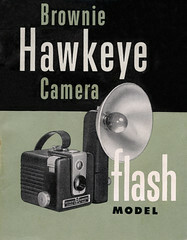 Kodak also provided multiple other flashguns for the terminals on these cameras, sometimes termed the "Kodalite" flashgun mount. A standout example is the "Generator Flashholder," which uses a dynamo to charge an internal capacitor, allowing either an M-size or a #5 flashbulb to be fired without batteries. 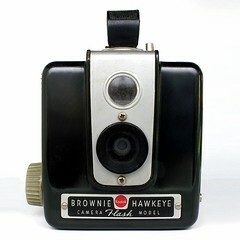 The aforementioned Brownie Bull's-Eye represents a more upscale cousin of the Hawkeye, with 6x9 exposure where the Hawkeye has 6x6, zone focusing instead of fixed, and double-exposure prevention where the Hawkeye has none. 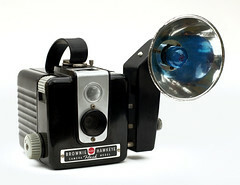 If a camera, for instance, has the letters CARM, it was manufactured in 12/53. Kodak used 13 4-week periods to divide up each year,  so those numbers would translate to the 12th 4-week period of 1953 (sometime between the latter half of November through the beginning of December). There are a few methods for this, some easier than others, most common listed here. The Hawkeye can fit a 120 spool in the film side and still have the camera close, but a 120 spool will not fit in the take up side. If your camera came with an original empty 620 spool then you can use 120 film in the camera providing you use a 620 spool for the take up side. Some people have reported this method can make advancing the film a little harder, so if you have this then it is normal. This is the same as the previous method but involves trimming excess plastic of the 120 spool with some scissors or nail clippers to make it fit better in the film side of the camera. Be careful to avoid exposing the edges of the film by cutting too much plastic. If you have a few 620 spools you can re-spool 120 film on to 620 in a dark room or a film changing bag  so that you can use only 620 spools with no issues. The camera can be modified to have features it lacked when produced, the most common ones are adding a tripod socket and a thread for a standard cable release  to make bulb exposures and portraits easier. Less common are adding strap lugs/rings to facilitate using a neck strap,  and modifying the camera to use a modern electronic flash unit. One increasingly popular modification is the flip the lens to produce a new effect. This effect is to reduce the focus area of the lens to between 2-5ft and generate soft focus edges. This modification is quite easy due to the ease with which the camera can be taken apart. ↑ The article International Fixed Calendar at Wikipedia notes Kodak's use of this quixotic calendar reform scheme. This page was last edited on 9 February 2019, at 00:15.